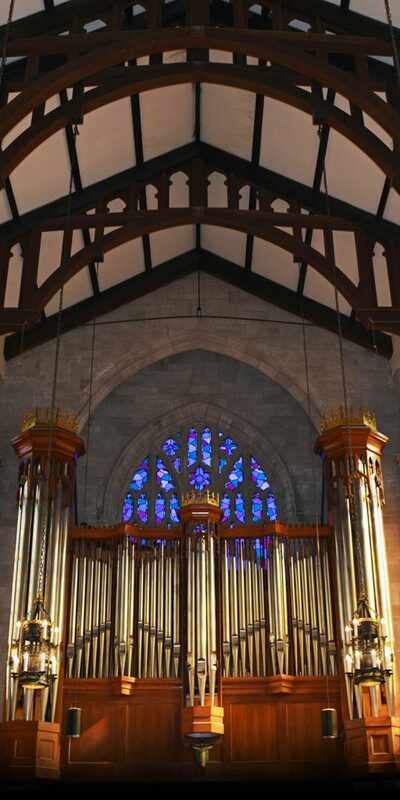 The pipe organ was built in 1991 by John-Paul Buzard Pipe Organ Builders. It is comprised of 29 straight speaking stops (36 ranks of pipes) and a Cymbalstern, across two manual keyboards and a pedal keyboard. It visually complements the Chapel’s gothic architecture, has been tonally designed to embrace the Anglican Musical Tradition. The organ’s console deliberately does not have a lock. All who are interested may come and play the instrument. We ask however that you announce yourself to the Administrative Assistant in the office at Canterbury House, wash your hands before playing upon the bone-plated keyboards, and wear proper organ shoes for playing the pedals.